Check out why we're loving the Jameston floor plan by Beechwood Homes. The living room is one of the most used and most public rooms of the house. It's where families reconnect. It's where we entertain guests. It's a place to kick back and relax, whether it's with a good book or a good movie or just good company. The best living rooms are versatile, roomy and welcoming, which is exactly how we'd describe this month's featured room of the house. This month's home is located in the Country Pointe Plainview subdivision in Plainview, New York. 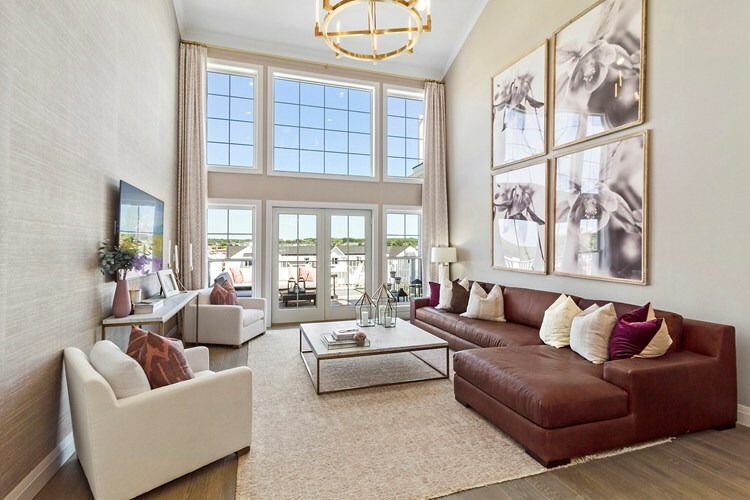 It's an interior townhome unit built by Beechwood Homes, Long Island's largest homebuilder and a Top 250 builder in the United States. The Jameston model is an almost 2,500 square foot, 2-story, 2.5 bath, 2-car garage townhome. The unit has 2 bedrooms, including a first-floor master bedroom, a den and a loft that overlooks the living room. Technically labelled a Great Room, this living room is perfectly positioned in the home - overlooking a deck, adjacent to the master bedroom, and blending seamlessly with the kitchen. Look up towards the vaulted ceiling and you can sneak a peek into the loft. All of this space makes the 15' x 24'2" room feel much larger than it is. Open Floor Plan Concept. 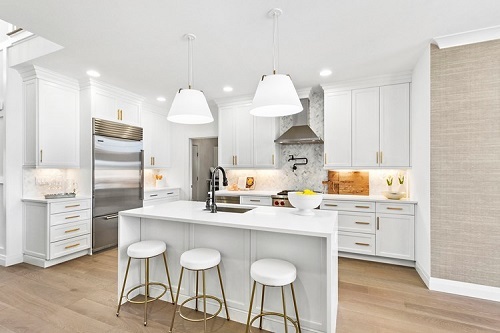 Open floor plans remain extremely popular with homebuyers. In this home, the living room is open to the dining room and the kitchen, and also to the deck. The floor plan works well for entertaining as well as for keeping an eye on the kids while they do homework, as Mom or Dad make dinner. Seamless Access to Outdoor Space. We've mentioned the access to the deck before and we'll mention it again because it's worth repeating. Double French doors open directly from the living room to the deck, which expands your entertainment space by that much. Floor to Ceiling Windows. While we're talking outdoor space, let's talk about that wall of windows! They bring the outdoors in and, thanks to the loft, the entire home is flooded with natural light. High, Vaulted Ceilings. 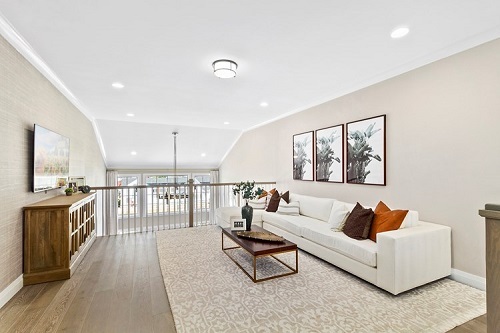 Townhomes can feel very closed in, particularly interior units such as this one, but the high ceilings in this unit create a sense of spaciousness. Without these high ceilings the entire character of the room would be changed. Textured Accent Wall. The light colored, textured wallpaper along one side of the space creates a warm and cozy feel while adding interest and creating a visual break to differentiate the living area from the kitchen. Painted Wall. Opposite the textured wall, is a flat, painted wall. This keeps the room from feeling overly stuffy as it may have if both sides of the room were wallpapered. Yet, the complementary colors pull the entire space together. Gold Accents. Gold is back! And, it can be such a difficult color to incorporate into a home without it feeling too flashy or over the top. It's been done very tastefully here. We see it in the chandelier, the picture frames, the coffee table, side table, and knick-knacks. It's also worth noting that the kitchen has gold cabinet hardware and the dining area also has a gold chandelier. Again... small touches that bring the three distinct areas together. Wood-Look Streaked Flooring. The same wood look flooring is used throughout the first story of the home to provide an even and consistent look that also has the effect of making the entire space look larger. The Loft. Lofts are wonderful bonus spaces when situated correctly and this home has placed it absolutely perfectly. Thanks to the vaulted ceilings, the loft is clearly visible from the living room which, again, has the effect of making the entire home feel bigger than it is. 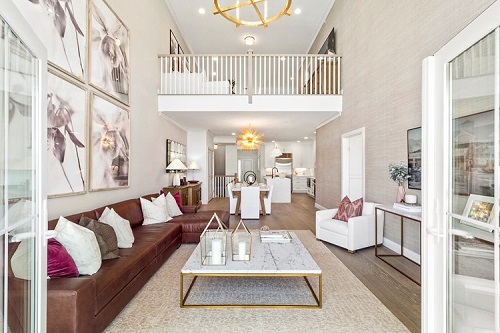 The location of the loft overlooking the living room means that while family members can have separate spaces, they can still easily communicate with one another. Modern Décor. The color scheme, accents, and furnishings are all very modern, giving the room a clean and crisp appearance. The neutral almost blush color scheme is a refreshing change from today's grays and the marble-topped coffee table is both functional and a focal point. It also complements the marble dining table and the light colored kitchen. Great room, living room, family room...whatever you call it, these are the gathering spots of the home. Explore thousands of such gathering spaces at HomLuv to gain inspiration for your own building, décor and design ideas, or shop new homes!